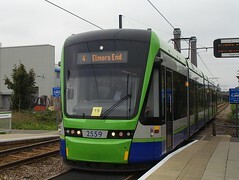 Tramlink route running between Elmers End Station and Therapia Lane Tram Stop. It's the newest of the four Tramlink routes, having started operating on 25 June 2012. Last edited 2013-09-25 11:28:53 (version 4; diff). List all versions. Page last edited 2013-09-25 11:28:53 (version 4).